For those of you that don't know, Halloween is my favorite holiday of all. Unfortunately I didn't have time this year to put out our decorations, but I did do some Halloween crafting. Below is a tea towel I made for my mom using a Crabapple Hill Studio pattern. I added the ribbon trim as well to spruce it up a bit. I also made a "Happy Halloween" banner for my mom. Also a Crabapple Hill Studio pattern. Here's a pic. It doesn't look too impressive, but this is one of the cutest things I have made in a long time. I hope to make a "Let it Snow" banner for our house, we'll see what time allows. The banner letters are a combo of embroidered fabric triangles sewn onto 2 different peices of wool felt. They were a little putsy to put together, but I think it will be easier if I get the lightbox I want for Christmas (hint, hint Mom and Dad). I also made a last minute costume for myself to wear to work. Pics will come later, but I've chickened out a little wearing it. I had several high priority, tense meeting this morning and something told me I wouldn't be taken seriously if I wore my mini-veiled-witch hat at the MGO . . .
UDPATE: Ok - my hat is just too cute not to picture so I snapped one at my desk with my phone. The veil is hard to see, but it's the best part! What do you think, work appropriate??? What the heck...sounds like if the past meetings were tense some levity might just be the ticket to lighten moods. Happy Halloween! Very cool. 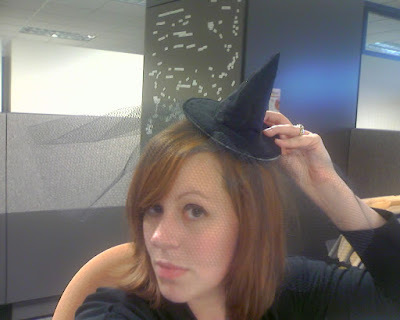 I was in full costume at work of course because Halloween is practically a theatrical display there. Seriously, there is a musical show at lunch time. I was Little Red Riding Hood and Beaker was the Wolf. Halloween is one of my favorite holidays too. Unfortunately my pumpkins were as spectacular this year because I couldn't find my drill. Boo. loved all of your festive projects! Banner looked great in the house with our Halloween village. I'll send pictures of all so you can see.